Cincinnati Vice Mayor Roxanne Qualls (C) has introduced a motion co-sponsored by Councilmembers Laure Quinlivan (D), Chris Seelbach (D), Yvette Simpson (D), Cecil Thomas (D) and Wendell Young (D) to eliminate minimum parking requirements in historic Over-the-Rhine and the Central Business District. The motion cited that current regulations require at least one parking space per dwelling unit and that providing parking can be a costly impediment to developers looking to invest in older buildings in the region’s urban core. That motion has been referred to the Livable Communities Committee, chaired by Vice Mayor Qualls, and could go before the full city council soon after. The new Central Riverfront Garage will soon be built over with new businesses, residences and even more parking mandated by law. Photograph by Randy A. Simes for UrbanCincy. 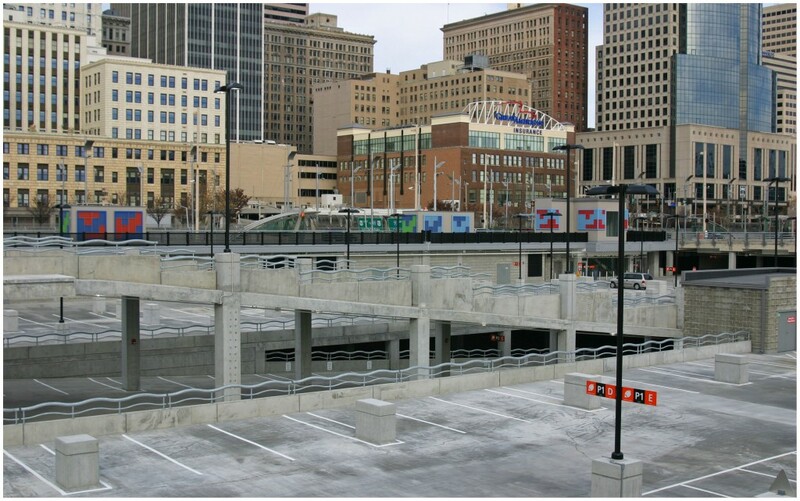 Chad Munitz, Executive Vice President of Development and Operations of the Cincinnati Center City Development Corporation (3CDC), estimates that parking mandates cost urban developers $5,000 for one surface parking space and $25,000 for a structured parking space on average. The increased cost associated with that parking, Munitz says, is then passed on to the consumer and raises the price of a residential unit by as much as $25,000. The announcement comes just two weeks after UrbanCincy proposed three solutions for reforming Cincinnati’s urban parking policies. One of those solutions included the idea of eliminating minimum parking requirements. Expanding on the impacts of eliminating parking requirements, Nashville urban planner Joni Priest indicated that removing parking minimums did not reduce the number of parking spaces developed for new downtown projects. Instead removing parking requirements allowed the preservation of historic buildings by allowing developers to become more creative in developing parking strategies such as shared off-site parking agreements, and it prepared the city for long-term transportation infrastructure improvements. Priest highlighted The Stahlman development as an example of a historic building that was revitalized because of the removed parking restrictions. The historic 12-story office building was rehabilitated into apartments, and sits directly across from the civic lawn that has parking beneath it. One parking space, Priest explained, is included in the rental price and additional spaces are available. “The Stahlman has been a big success because it is a great building with a great view in the heart of a great city, but also because the developer was able to find a practical solution to a problem that plagues historic structures,” concluded Priest who went on to say that similar stories can be told for other developments near Nashville’s library garage. 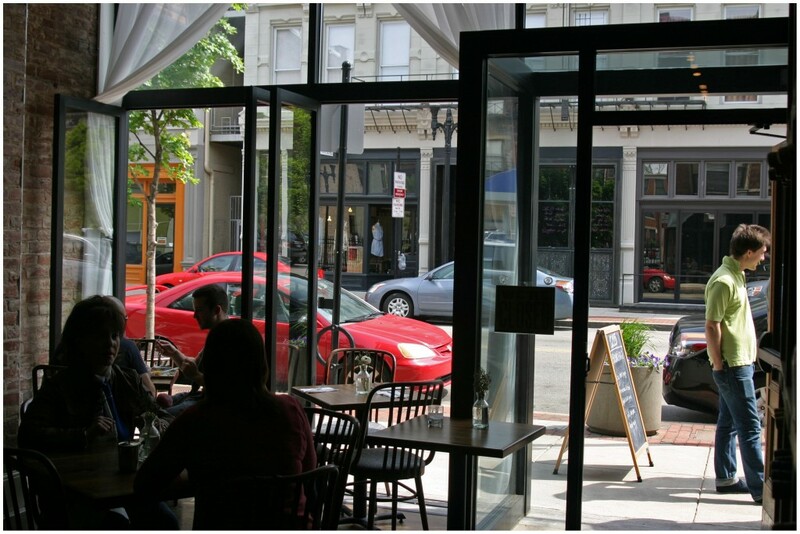 Small businesses in neighborhoods like historic Over-the-Rhine often stuggle to provide minimum parking requirements drafted with suburban business models in mind. Photograph by Randy A. Simes for UrbanCincy. The expansion and renovation of Washington Park offers a similar opportunity in Cincinnati’s historic Over-the-Rhine neighborhood where a great deal of new investment is taking place. Additionally, the results from Nashville seem to find that easing parking requirements would immediately make it easier to convert historic office buildings into residential uses. The idea, policy makers say, is to allow the free market to operate within an urban context and allow cities like Nashville to anticipate increased demand for non-automobile forms of transportation. As investment continues to spike in Cincinnati’s urban core, and construction work moves forward on the city’s new streetcar system, it becomes increasingly clear that the policy shift is more about lifestyle options than anything else.